Today, data is your business, and it’s growing exponentially at an accelerated pace. How you store, secure and access your data is important. You need a solution that scales, with a high-efficiency cost model. IBM Cloud Object Storage can be deployed on-premise or in a hosted IBM Cloud (SoftLayer) environment, providing you with the ideal object based storage platform for hybrid cloud. IBM Cloud Object Storage is also an integral part of the IBM storage family - delivering a broad range of storage options to satisfy the most demanding requirements – all from a single, trusted vendor. Work for IBM Cloud Object Storage? "Cloud Storage beyond its time!" IBM Cloud Storage is both easy and fast. It allows us to setup object storage in mins, and best of all, they give us a whopping 10TB capacity, more than enough to handle any of our current and future object storage needs. They provide an easy to use interface, tools to facilitate migration , and testing, and they have embedded AI tools to monitor and let you know if everything is working as it should be. The support is beyond useful, they provide chat, phone, email support that responds in mins not days. They even provide step by step documentation on all the major providers and development languages to guide you. They speed and reliability of their network seems to improve constantly , leaving us always happy with response times and loading of our Assets on the IBM Cloud Object Storage. They are always keeping us in the loop of scheduled maintenance and improvements they are doing and they even migrate things for us , if anything were to possible affect us. We are beyond satisfied with the IBM Cloud Object Storage services we receive. At the moment we have not found any dislikes. Test them out they offer a free trial, and $200 Credit. As our services grow, we found that speed and performance would become an issue even with flexible cloud solutions, using the IBM Cloud Object Storage we can effectively load our code without worrying about bogging down resources that use to be used by assets, now stored in the IBM Object Storage Cloud. "One of the best Cloud Storage Platforms"
IBM Cloud is different when compared to all other cloud servers, It provides so many services, maintaining test cases and defects are possible through IBM cloud and it is very simple to use. IBM Cloud makes sure the privacy of data is more important like this it protects individual data very carefully. IBM Cloud support have very good agents they solve any of our problems. I have experienced some drop in connection which is a problem for continuous usage of cloud services. The price tag can be a bit much depending on the size of your company. IBM cloud storage facility helps my company with this storage facility with the highest level of threat protection and privacy. The interface is super simple, and we can easily upload our day to day documents and share them with the colleagues. What Object Storage solution do you use? "The data never miss again!" The data protection. As a business company, the privacy and safety of the data are very important. IBM Cloud Object Storage can protect our data from deletion and modification, it can really save us from the operation mistakes. So far so good I think. Maybe because I just use the few functions of this software, it's pretty nice for the fundamental need. The fast transfer speed. IBM Cloud Object Storage is one of the fastest transfer software I used. It saves our transfer time and really help us when we are in the middle of the meeting and need to download something on the cloud quickly. "Very easy to use and plenty of storage "
"Better than Google Cloud "
IBM Cloud Storage allows me to store documents fro many device and not just from one device. It's a very useful platform for all of my documents. Pricing is a little expensive especially if you store a lot of data. This program even though is a little pricey is worth the money. It saves your company and helps to run the company more smoothly by being able to share files easily with other employees. It has allowed me to open documents from my company more conveniently and has helped to run the company more efficiently. "Store whatever you want whenever you want"
The object store solution it’s very reliable and it’s tailored to your needs. You pay for the amount of data stored you use. Because it’s scalable you have to thoroughgoing plan the days you will save on the cloud. That requires a lot of work. We can save money by the option of scalable. Also our data are very secure and we can access them from any device we authorize. I actually like the ease of use or user friendliness of this particular software. I don’t like having to train others on this software because they sometimes try to create their own way to use it and create unnecessary issues. This is used for unstructured data that we need storage for. It secures that data until we’re actually ready to either structure it or demo it. "Reliable & Scalable Object Store Solution. Fast enough for AI"
achieve a high-bandwidth parallel file system solution, with a high stability and robustness. External IPs are not provided for free account. what I like best about IBM Cloud Object Storage is that it is very easy to use and it saves storage in your computer. I don't dislike anything about IBM Cloud Object Storage, I think everything is good! I love how it saves room in my computer. I am using this for my Social Media business and it has been very helpful. I like being able to invite team members as well as giving them certain permissions. I wouldn't say it's the most user-friendly application, but it definitely isn't supposed to be. I'm trying to overcome the limitations of traditional FTP and HTTP transfers by utilizing Aspera high-speed transfer. "Very easy to use - secure strorage"
Keeping track of information organizing reports and file storage. I like having all data located in one place accessible anywhere you have a secure connection. It is very useful when collaborating and sharing data and conducting meetings. I dislike the fact that there is always constant threats and vulnerabilities to think about when using the cloud based database. Make sure you have a team that can handle transition and plan for a short period of data sharing uploads to be backlogged and prepare for ongoing tweaks and revisions. It provides a safe yet efficient place to retrieve store and update information while driving down cost of storing physical data. 1. This is a low cost Archive. 2. Data transfer is very fast. 3. Data is protected and is secured. 2. This is pay as you go. We need to buy it rather than free storage space. Very good product with improved security for the data stored. IBM is always providing the best of the best, but not always the best solution when user adaption is on a learning curve. It is easy to use and the documentation and code examples are comprehensive. There is a lot of dependency on the documention of AmazonS3. I worked on a POC with connecting working with ICOS but I imagine that we could use it to store legacy data. Very few drops, speed is never and issue and attractive. I don’t have really any dislikes. Having the ability to try it for a month and then choose whether we wanted to use it, was awesome. "IBM Storage Cloud Gets Job Done"
Customer service could improve for any questions after implementation. Learning about IBM Cloud Object Storage? 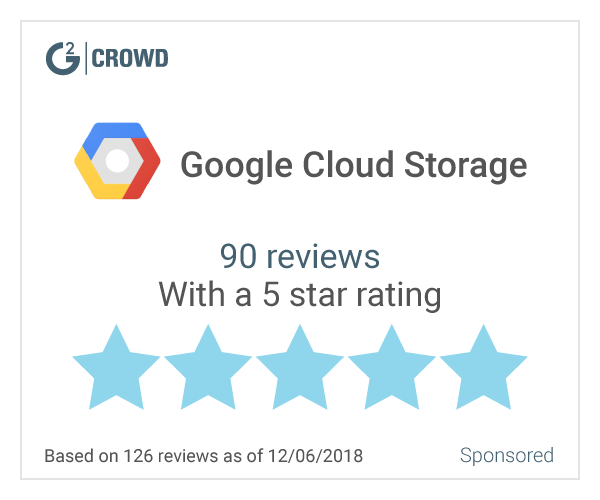 * We monitor all IBM Cloud Object Storage reviews to prevent fraudulent reviews and keep review quality high. We do not post reviews by company employees or direct competitors. Validated reviews require the user to submit a screenshot of the product containing their user ID, in order to verify a user is an actual user of the product. Hi there! Are you looking to implement a solution like Object storage?